Remove seeds from pumpkin, maybe peel (hokkaido pumpkin one does not need to peel), chop into chinks. Mix soft goat cheese, parsley (chopped) and finely chopped garlic with some almond milk, add salt, pepper, curcuma and cumin to taste. Cover the bottom with pumpkin chinks, potato dices, broccoli florets. Cover this with the cheese parsley milk mix. Place the remaining pumpkin chinks on top and scatter the feta cheese onto it. Cover the casserole with aluminium foil and bake at 210°C for about 35 minutes. 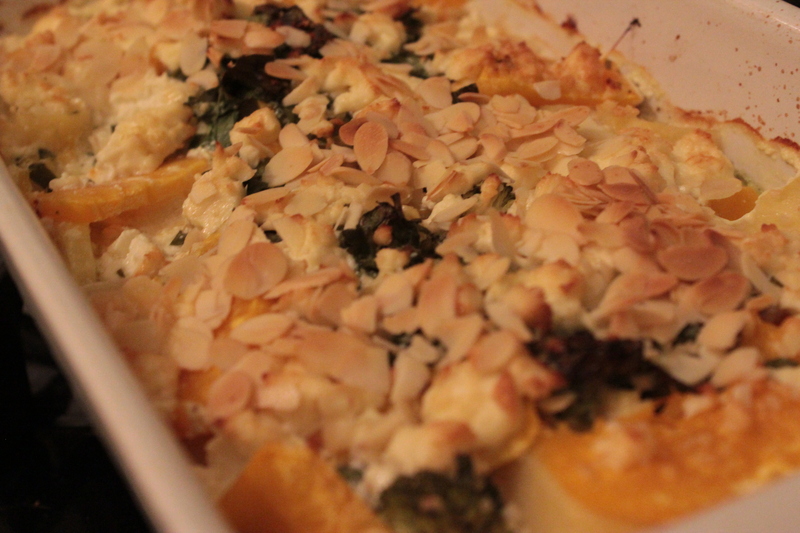 Remove the foil and scatter the sliced almonds onto the feta and bake until its done.